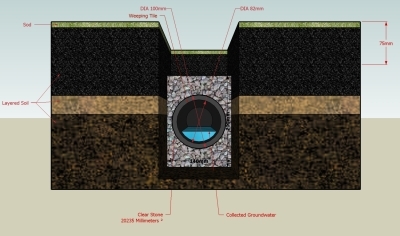 French drain systems are the perfect solution for coping with excess rainwater accumulation. They are engineered to avoid basement leaking and foundation damage using landscaping fabric or PVC and gravel. If you would prefer to have a plumber or handyman do the installation for you, I recommend Angies List. They makes it easy to find the best. Join today. Theres many cases where a homeowner's property has rainwater drainage issues. One common scenario is where a neighboring property resides at a higher elevation causing excessive rainwater to naturally drain towards the lower property and settling in lower elevations. This can easily result in foundation damage, which in turn leads to expensive foundation repair. Or in other locales, the end result is going to be basement leaking and damage. An elegant solution is to install French drain systems. Any excessive rainwater coming off the roof can be handled with gutter downspouts. How Does it Handle Rainwater Runoff? The subterranean drain creates a below-ground channel which funnels water runoff from a specific area to a lower one. This is a classic example of green landscaping. No pumps to run, fuel, and service. No pouring concrete. And, its extremely affordable. Gravity does all the heavy lifting (or, lowering)! Choosing the proper location for your drain is the primary step when engineering how the rain water runs off. The location where the water pools is the logical place to starting. The trick is now to find a lower elevation to shift the water to. Digging your trench is physically the most difficult part of this DIY project and it has its own inherent problems to consider. Most utilities are located underground during residential construction nowadays, indeed, in almost all real estate construction. They include phone lines, gas lines, and coax and fiber optic laid by cable television and broadband services. Once your most direct trench line has been decided on, its very critical to get all these services in the loop to be positive that no lines will be cut. This will not only minimize opening a major can of worms, but itll demonstrate that due diligence has been done in case things go awry. This is the simple part: deciding on the depth and width of your French ditch. At minimum, your trench should be a minimum of 6 wide and perhaps wider dependant on the maximum volume of runoff rain. And as for depth? The rule of thumb says it should begin at least as deep as the shallowest area where it tends to pool. But the thing to remember is that the elevation where the water will be delivered has to be lower than the initial pooling area so that the French drain system to work as designed. Ideally, the elevation should be a 1 drop for each 100 of the trenchs run. Check your depth using a level staked string line running from one end to the other. Now that your trench is dug, line it with landscaping fabric, allowing a few inches to overlap the trenchs lip on both sides. Next, pour coarse gravel into the trench. Pea gravel will work, but a coarser gravel will drain more efficiently. Fold the landscape fabric over the gravel. The purpose of this is to keep sand and soil from drifting down into the gravel, hampering water flow. Cover this with a layer of coarse sand to anchor it all, then add soil up to the lever where grass sod will lay level with the lawn. Proceed with the sod installation, and its mission accomplished! An alternative method is to substitute perforated PVC pipe for the landscape fabric bundle.